You are probably thinking of having eyelash extensions because you are reading this. Will it hurt? Will it damage my natural eyelashes? How long will it last? How much does it cost? Those are the few questions we normally receive on a daily basis. While we can answer every single one of your concern, we thought that it is better if it’ll come from a customer themselves. Disclaimer: We are not badmouthing other eyelash extensions salon. What you will read here is purely based on what we thought is a better approach in having an eyelash extensions. 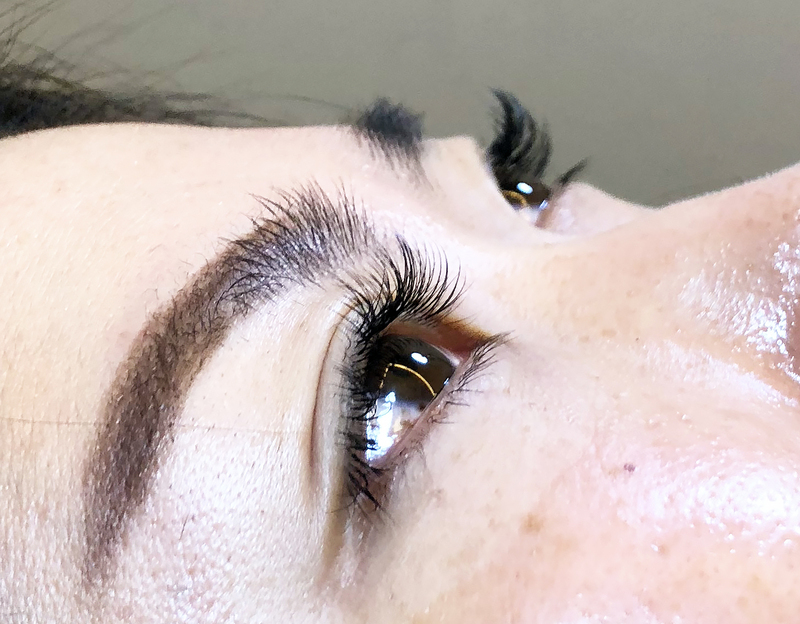 While there are good salons that offers high-quality service, there are still some who are definitely not worth your money or worth losing your natural eyelashes. We will hide the name of the customer for privacy purposes and call her Ms. M.U. She had an eyelash extension + Removal of existing eyelash extensions from another salon in our Conrad branch last June 21, 6pm Eyelash extensions + removal from other salon. She opted to have her eyelashes done by our senior eyelash designer, Minako Endoh. 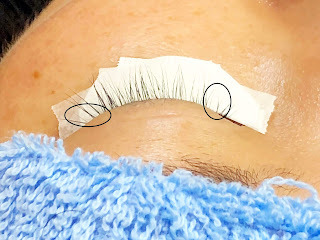 The photo below shows the condition of Ms. M.U’s eyelashes made by a Japanese Salon in Makati. According to her, the salon was owned by a Japanese, however, upon entering the salon, she noticed that there is no Japanese staff doing the services. Still, she decided to do it for a few times. Ms. M.U is a Japanese, that’s why she trusted this J salon to do her lashes. By the time she had her eyelashes done, the technician who did it claimed to be trained by a Japanese professional, making her trust them even more. The price was 1,800 for a Volume Lash Design (this is a new technique in Japan) with about 50 bundles. During the service, she felt uncomfortable as the staff’s hand was leaning onto her forehead. Also, while J salon’s staff was removing her current lashes, she felt like the staff was tugging her eyelashes making it painful. She can tolerate the pain, so she did not complain. After Minako-san checked the situation of Ms. M.U’s eyelashes, she immediately noticed that it was Volume Lash, the latest technique in Japan. Unfortunately, the way it was done, it doesn’t seem like it will pass a Japanese standard. The way J Salon did Ms. M.U’s lash extensions doesn’t have consistency. It was a combination of 3D, 5D, and 6D lashes which is not good for the natural lashes. Volume Lash should be dispersed and open, but the salon’s Volume lash was closed and clumped together. It seems like J Salon focuses on thickness without thinking about what is best for the natural lashes. Volume Lash should have obvious volume, but still look natural. The roots of the lash extensions are attached to the skin, that’s why it feels painful and itchy. 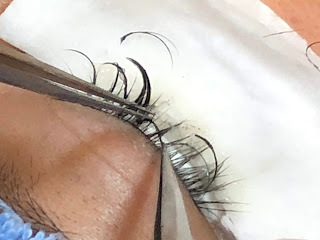 They also used too much glue which resulted to two natural lashes to stick together, which is causing the itchiness as each natural eyelashes have different growth cycle. This will result to breakage of natural eyelash. In our opinion, that kind of service makes the eyelashes more damaged. Thankfully, her natural eyelashes are very strong that some of it are still alive, while the rest are weak and think already. We also noticed that there are gaps in her eyelashes. See photo above. She still wanted to have a Volume Lash design because she likes her eyelashes looking glamorous, but as much as we want to make her request, we want to do what is best for her. In the J salon, she had 10, 11, 12mm, but we suggest, 9,10,11mm which is shorter with 130 pcs only – this is more advantageous to her lashes. Those eyelashes who are strong enough had single lashes, then the weak ones had 3D lashes to still have the effect she wanted. During the removal time, we took almost 60 minutes because of too much glue and combined eyelashes. Normally, the removal and preparation are only 20 mins. My new lashes are beyond my expectations. I trusted Minako-san because of her expertise and her suggestions on how to make my natural eyelashes healthier. She also suggested a long term plan for my next eyelash extensions visits. Kiyosa’s lash extensions is so much lighter and natural looking feeling compared to my last one. I did not feel anything at all during and after the service. The staff are very polite and accommodating. Note – We don’t offer Volume Design as of the moment. Should you wish to avail this, only Minako-san in our Conrad branch can do it. Price may still vary.